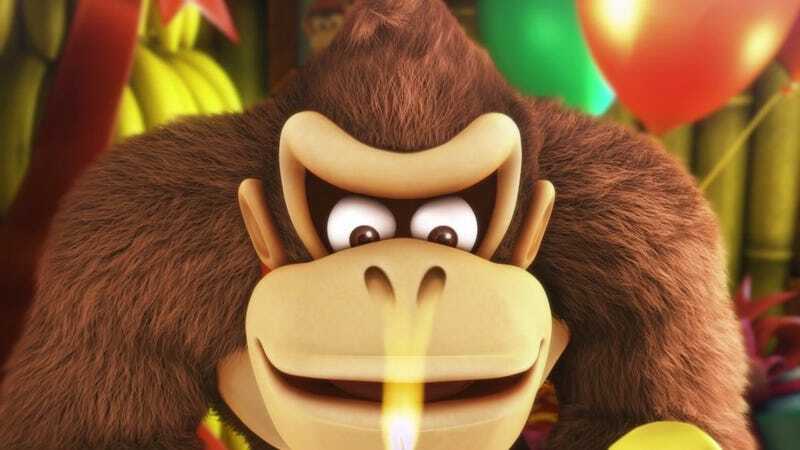 With its rerelease on the Switch, I had the pleasure of playing through one of my favorite games of all time recently: Donkey Kong Country: Tropical Freeze. I honestly think that this masterpiece is about as close you can get to perfection in a video game, so today I’d like to talk about some of my favorite stages in Retro Studio’s labor of love. If you’ve played the game, let me know what your favorites are in the comments! If you haven’t played it, you should go do that. Like, right now. The rocket barrel levels in DKC:TF never fail to be exhilarating, and this one is the best of the bunch. Speeding through a colorful jungle as a penguin in a mech suit attacks you with fruit is fun on its own, but the dynamic camera angles really elevate this level for me. The over-the-shoulder viewpoint makes the whole thing feel like a boss battle, even if all you’re doing is evading the penguin’s attacks. Plus, you get to see the penguin get eaten by a carnivorous plant at the end. What more could you ask for? You know a platformer is great when the water levels are some of the highlights of the game. Level 4-3 is a shining example of how to do these typically irritating stages right. First of all, it’s utterly gorgeous. The quasi-silhouette aesthetic really sells the abyssal atmosphere, and the occasional illumination by the jellyfish, anemone, and bioluminescent fish gives the whole stage an otherworldly vibe. Those aesthetics aren’t wasted on visual pleasure though, as the light from the fish causes the dangerous anemone to retract when they are attacked. Amiss Abyss is a great example of how to creatively unify visuals and gameplay without sacrificing the quality of either. Sorry, that was a lame transition. The mine cart levels in this game can feel fairly similar, but each one still manages to be unique and memorable through careful variations in its design. Sawmill Thrill accomplishes this by forgoing the mine cart for a third of the stage in favor of a shoddily-crafted boat. The raging thunderstorm and jaw dropping music create a substantial amount of tension as DK continually submerges himself by jumping in and out of the water. Jump too late and you will be hurt by the dangers at the surface. Jump too early and the underwater hazards will harm you instead. The remainder of the level is amazing as well- especially when the saw blades create the tracks as you are riding on them- but the boat section alone is enough to cement this as a comfortable number two. I had to put some thought into which levels to choose for numbers two through five, but number one was never in question. I was tempted to write an entire article on this stage alone, but that felt a little too indulgent. Grassland Groove is condensed happiness in video game form. The entire level dances along with the upbeat, catchy music, creating platform challenge along with the euphoric atmosphere. It almost feels as though the level is welcoming you to world 3, reassuring you that the fun of Donkey Kong Country: Tropical Freeze has only just begun. As you reach the final dancing animal float that houses the end of the stage, the music swells into a crescendo of vocalists singing the name of the protagonist. “Donkey Kooooong,” they declare triumphantly against the backdrop of a beautiful savanna sunset. It doesn’t matter how many times I play it; this stage always leaves me grinning from ear to ear. It’s not just the best level in this game, it’s a strong contender for the best 2-D platforming level of all time. There you go. Five incredible stages from an equally incredible game. And two days down in our long and difficult journey! I’ll do my best to not talk about Nintendo games for the entirety of the SixTAY Days of Writing, but I won’t make any promises.